In 1996 Congress directed the Secretary of the Army to conduct a review of all Asian Americans and Pacific Islanders who were awarded the Distinguished Service Cross in World War II "to determine whether any such award should be upgraded to the Medal of Honor." The task of identifying soldiers who qualified for the review and locating the required official documentation was given to the Command History Office at the Defense Language Institute Foreign Language Center, Presidio of Monterey, California. The team completed their research in September 1998 and turned their findings over to the US Army's Military Awards Branch. On 21 June 2000 President William Clinton awarded the Medal of Honor to 22 Asian-Pacific Americans. The citations for the 22 recipients, awarded on 21 June 2000, have been integrated and are listed with the previous Medal of Honor Recipients. The citations are presented chronologically by war, and then alphabetically within each conflict. Rank and organization: Private, 34th Company, Philippine Scouts. Place and date: At Lapurap, Basilan, Philippine Islands, 24 September 1911. Entered service at: San Fernandos Union, P.I.. Birth: San Fernandos Union, P.I.. Date of issue: Unknown. Citation: Having been badly wounded (his left arm was broken and lacerated and he had received several spear wounds in the body so that he could not stand) continued to fire his rifle with one hand until the enemy was repulsed, thereby aiding materially in preventing the annihilation of his party and the mutilation of their bodies. Private Barney F. Hajiro distinguished himself by extraordinary heroism in action on 19, 22, and 29 October 1944, in the vicinity of Bruyeres and Biffontaine, eastern France. Private Hajiro, while acting as a sentry on top of an embankment on 19 October 1944, in the vicinity of Bruyeres, France, rendered assistance to allied troops attacking a house 200 yards away by exposing himself to enemy fire and directing fire at an enemy strong point. He assisted the unit on his right by firing his automatic rifle and killing or wounding two enemy snipers. On 22 October 1944, he and one comrade took up an outpost security position about 50 yards to the right front of their platoon, concealed themselves, and ambushed an 18-man, heavily armed, enemy patrol, killing two, wounding one, and taking the remainder as prisoners. On 29 October 1944, in a wooded area in the vicinity of Biffontaine, France, Private Hajiro initiated an attack up the slope of a hill referred to as "Suicide Hill" by running forward approximately 100 yards under fire. He then advanced ahead of his comrades about 10 yards, drawing fire and spotting camouflaged machine gun nests. He fearlessly met fire with fire and single-handedly destroyed two machine gun nests and killed two enemy snipers. As a result of Private Hajiro's heroic actions, the attack was successful. Private Hajiro's extraordinary heroism and devotion to duty are in keeping with the highest traditions of military service and reflect great credit upon him, his unit, and the United States Army. Private Mikio Hasemoto distinguished himself by extraordinary heroism in action on 29 November 1943, in the vicinity of Cerasuolo, Italy. A force of approximately 40 enemy soldiers, armed with machine guns, machine pistols, rifles, and grenades, attacked the left flank of his platoon. Two enemy soldiers with machine guns advanced forward, firing their weapons. Private Hasemoto, an automatic rifleman, challenged these two machine gunners. After firing four magazines at the approaching enemy, his weapon was shot and damaged. Unhesitatingly, he ran 10 yards to the rear, secured another automatic rifle and continued to fire until his weapon jammed. At this point, Private Hasemoto and his squad leader had killed approximately 20 enemy soldiers. Again, Private Hasemoto ran through a barrage of enemy machine gun fire to pick up an M-1 rifle. Continuing their fire, Private Hasemoto and his squad leader killed 10 more enemy soldiers. With only three enemy soldiers left, he and his squad leader charged courageously forward, killing one, wounding one, and capturing another. 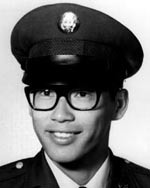 The following day, Private Hasemoto continued to repel enemy attacks until he was killed by enemy fire. 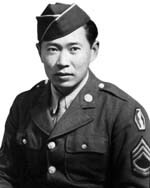 Private Hasemoto's extraordinary heroism and devotion to duty are in keeping with the highest traditions of military service and reflect great credit on him, his unit, and the United States Army. Joe Hayashi distinguished himself by extraordinary heroism in action on 20 and 22 April 1945, near Tendola, Italy. On 20 April 1945, ordered to attack a strongly defended hill that commanded all approaches to the village of Tendola, Private Hayashi skillfully led his men to a point within 75 yards of enemy positions before they were detected and fired upon. After dragging his wounded comrades to safety, he returned alone and exposed himself to small arms fire in order to direct and adjust mortar fire against hostile emplacements. Boldly attacking the hill with the remaining men of his squad, he attained his objective and discovered that the mortars had neutralized three machine guns, killed 27 men, and wounded many others. On 22 April 1945, attacking the village of Tendola, Private Hayashi maneuvered his squad up a steep, terraced hill to within 100 yards of the enemy. Crawling under intense fire to a hostile machine gun position, he threw a grenade, killing one enemy soldier and forcing the other members of the gun crew to surrender. Seeing four enemy machine guns delivering deadly fire upon other elements of his platoon, he threw another grenade, destroying a machine gun nest. He then crawled to the right flank of another machine gun position where he killed four enemy soldiers and forced the others to flee. Attempting to pursue the enemy, he was mortally wounded by a burst of machine pistol fire. The dauntless courage and exemplary leadership of Private Hayashi enabled his company to attain its objective. 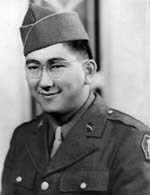 Private Hayashi's extraordinary heroism and devotion to duty are in keeping with the highest traditions of military service and reflect great credit on him, his unit, and the United States Army. Private Shizuya Hayashi distinguished himself by extraordinary heroism in action on 29 November 1943, near Cerasuolo, Italy. During a flank assault on high ground held by the enemy, Private Hayashi rose alone in the face of grenade, rifle, and machine gun fire. Firing his automatic rifle from the hip, he charged and overtook an enemy machine gun position, killing seven men in the nest and two more as they fled. After his platoon advanced 200 yards from this point, an enemy antiaircraft gun opened fire on the men. Private Hayashi returned fire at the hostile position, killing nine of the enemy, taking four prisoners, and forcing the remainder of the force to withdraw from the hill. 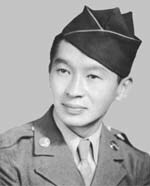 Private Hayashi's extraordinary heroism and devotion to duty are in keeping with the highest traditions of military service and reflect great credit on him, his unit, and the United States Army. Second Lieutenant Daniel K. Inouye distinguished himself by extraordinary heroism in action on 21 April 1945, in the vicinity of San Terenzo, Italy. 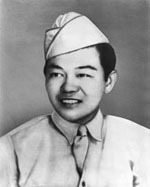 While attacking a defended ridge guarding an important road junction, Second Lieutenant Inouye skillfully directed his platoon through a hail of automatic weapon and small arms fire, in a swift enveloping movement that resulted in the capture of an artillery and mortar post and brought his men to within 40 yards of the hostile force. Emplaced in bunkers and rock formations, the enemy halted the advance with crossfire from three machine guns. With complete disregard for his personal safety, Second Lieutenant Inouye crawled up the treacherous slope to within five yards of the nearest machine gun and hurled two grenades, destroying the emplacement. Before the enemy could retaliate, he stood up and neutralized a second machine gun nest. Although wounded by a sniper's bullet, he continued to engage other hostile positions at close range until an exploding grenade shattered his right arm. Despite the intense pain, he refused evacuation and continued to direct his platoon until enemy resistance was broken and his men were again deployed in defensive positions. In the attack, 25 enemy soldiers were killed and eight others captured. 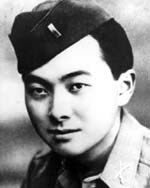 By his gallant, aggressive tactics and by his indomitable leadership, Second Lieutenant Inouye enabled his platoon to advance through formidable resistance, and was instrumental in the capture of the ridge. Second Lieutenant Inouye's extraordinary heroism and devotion to duty are in keeping with the highest traditions of military service and reflect great credit on him, his unit, and the United States Army. Technical Sergeant Yeiki Kobashigawa distinguished himself by extraordinary heroism in action on 2 June 1944, in the vicinity of Lanuvio, Italy. During an attack, Technical Sergeant Kobashigawa's platoon encountered strong enemy resistance from a series of machine guns providing supporting fire. Observing a machine gun nest 50 yards from his position, Technical Sergeant Kobashigawa crawled forward with one of his men, threw a grenade and then charged the enemy with his submachine gun while a fellow soldier provided covering fire. He killed one enemy soldier and captured two prisoners. Meanwhile, Technical Sergeant Kobashigawa and his comrade were fired upon by another machine gun 50 yards ahead. Directing a squad to advance to his first position, Technical Sergeant Kobashigawa again moved forward with a fellow soldier to subdue the second machine gun nest. After throwing grenades into the position, Technical Sergeant Kobashigawa provided close supporting fire while a fellow soldier charged, capturing four prisoners. On the alert for other machine gun nests, Technical Sergeant Kobashigawa discovered four more, and skillfully led a squad in neutralizing two of them. Technical Sergeant Kobashigawa's extraordinary heroism and devotion to duty are in keeping with the highest traditions of military service and reflect great credit on him, his unit, and the United States Army. Staff Sergeant Robert T. Kuroda distinguished himself by extraordinary heroism in action, on 20 October 1944, near Bruyeres, France. 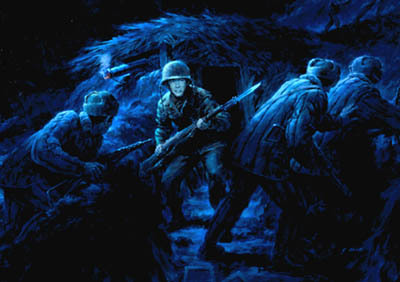 Leading his men in an advance to destroy snipers and machine gun nests, Staff Sergeant Kuroda encountered heavy fire from enemy soldiers occupying a heavily wooded slope. Unable to pinpoint the hostile machine gun, he boldly made his way through heavy fire to the crest of the ridge. 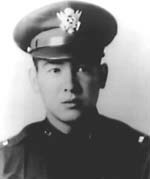 Once he located the machine gun, Staff Sergeant Kuroda advanced to a point within ten yards of the nest and killed three enemy gunners with grenades. He then fired clip after clip of rifle ammunition, killing or wounding at least three of the enemy. As he expended the last of his ammunition, he observed that an American officer had been struck by a burst of fire from a hostile machine gun located on an adjacent hill. Rushing to the officer's assistance, he found that the officer had been killed. Picking up the officer's submachine gun, Staff Sergeant Kuroda advanced through continuous fire toward a second machine gun emplacement and destroyed the position. As he turned to fire upon additional enemy soldiers, he was killed by a sniper. Staff Sergeant Kuroda's courageous actions and indomitable fighting spirit ensured the destruction of enemy resistance in the sector. Staff Sergeant Kuroda's extraordinary heroism and devotion to duty are in keeping with the highest traditions of military service and reflect great credit on him, his unit, and the United States Army. Rank and organization: Private First Class, U.S. Army, Company A, 100th Infantry Battalion, 442d Combat Team. Place and date: Near Seravezza, Italy, 5 April 1945. Entered service at: Los Angeles, Calif Birth: Los Angeles, Calif. G.O. No.. 24, 7 March 1946. Citation: He fought with great gallantry and intrepidity near Seravezza, Italy. 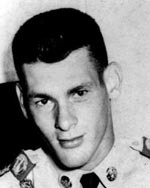 When his unit was pinned down by grazing fire from the enemy's strong mountain defense and command of the squad devolved on him with the wounding of its regular leader, he made frontal, l-man attacks through direct fire and knocked out 2 machineguns with grenades Withdrawing under murderous fire and showers of grenades from other enemy emplacements, he had nearly reached a shell crater occupied by 2 of his men when an unexploded grenade bounced on his helmet and rolled toward his helpless comrades. He arose into the withering fire, dived for the missile and smothered its blast with his body. By his swift, supremely heroic action Pfc. Munemori saved 2 of his men at the cost of his own life and did much to clear the path for his company's victorious advance. 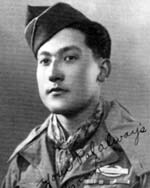 Private First Class Kiyoshi K. Muranaga distinguished himself by extraordinary heroism in action on 26 June 1944, near Suvereto, Italy. Private First Class Muranaga’s company encountered a strong enemy force in commanding positions and with superior firepower. An enemy 88mm self-propelled gun opened direct fire on the company, causing the men to disperse and seek cover. Private First Class Muranaga’s mortar squad was ordered to action, but the terrain made it impossible to set up their weapons. The squad leader, realizing the vulnerability of the mortar position, moved his men away from the gun to positions of relative safety. 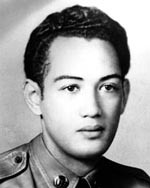 Because of the heavy casualties being inflicted on his company, Private First Class Muranaga, who served as a gunner, attempted to neutralize the 88mm weapon alone. Voluntarily remaining at his gun position, Private First Class Muranaga manned the mortar himself and opened fire on the enemy gun at a range of approximately 400 yards. With his third round, he was able to correct his fire so that the shell landed directly in front of the enemy gun. Meanwhile, the enemy crew, immediately aware of the source of mortar fire, turned their 88mm weapon directly on Private First Class Muranaga’s position. Before Private First Class Muranaga could fire a fourth round, an 88mm shell scored a direct hit on his position, killing him instantly. 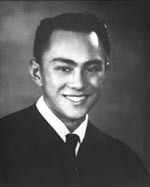 Because of the accuracy of Private First Class Muranaga’s previous fire, the enemy soldiers decided not to risk further exposure and immediately abandoned their position. Private First Class Muranaga ’s extraordinary heroism and devotion to duty are in keeping with the highest traditions of military service and reflect great credit on him, his unit, and the United States Army. 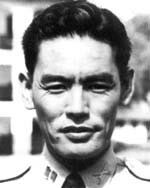 Private Masato Nakae distinguished himself by extraordinary heroism in action on 19 August 1944, near Pisa, Italy. When his submachine gun was damaged by a shell fragment during a fierce attack by a superior enemy force, Private Nakae quickly picked up his wounded comrade's M-1 rifle and fired rifle grenades at the steadily advancing enemy. As the hostile force continued to close in on his position, Private Nakae threw six grenades and forced them to withdraw. During a concentrated enemy mortar barrage that preceded the next assault by the enemy force, a mortar shell fragment seriously wounded Private Nakae. Despite his injury, he refused to surrender his position and continued firing at the advancing enemy. By inflicting heavy casualties on the enemy force, he finally succeeded in breaking up the attack and caused the enemy to withdraw. Private Nakae's extraordinary heroism and devotion to duty are in keeping with the highest traditions of military service and reflect great credit on him, his unit, and the United States Army. Private Shinyei Nakamine distinguished himself by extraordinary heroism in action on 2 June 1944, near La Torreto, Italy. During an attack, Private Nakamine's platoon became pinned down by intense machine gun crossfire from a small knoll 200 yards to the front. On his own initiative, Private Nakamine crawled toward one of the hostile weapons. Reaching a point 25 yards from the enemy, he charged the machine gun nest, firing his submachine gun, and killed three enemy soldiers and captured two. Later that afternoon, Private Nakamine discovered an enemy soldier on the right flank of his platoon's position. Crawling 25 yards from his position, Private Nakamine opened fire and killed the soldier. Then, seeing a machine gun nest to his front approximately 75 yards away, he returned to his platoon and led an automatic rifle team toward the enemy. 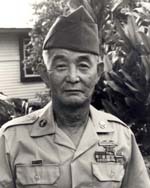 Under covering fire from his team, Private Nakamine crawled to a point 25 yards from the nest and threw hand grenades at the enemy soldiers, wounding one and capturing four. Spotting another machine gun nest 100 yards to his right flank, he led the automatic rifle team toward the hostile position but was killed by a burst of machine gun fire. Private Nakamine's extraordinary heroism and devotion to duty are in keeping with the highest traditions of military service and reflect great credit on him, his unit, and the United States Army. 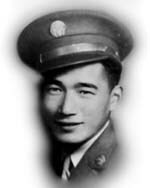 Private First Class William K. Nakamura distinguished himself by extraordinary heroism in action on 4 July 1944, near Castellina, Italy. During a fierce firefight, Private First Class Nakamura's platoon became pinned down by enemy machine gun fire from a concealed position. 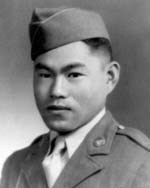 On his own initiative, Private First Class Nakamura crawled 20 yards toward the hostile nest with fire from the enemy machine gun barely missing him. Reaching a point 15 yards from the position, he quickly raised himself to a kneeling position and threw four hand grenades, killing or wounding at least three of the enemy soldiers. The enemy weapon silenced, Private First Class Nakamura crawled back to his platoon, which was able to continue its advance as a result of his courageous action. Later, his company was ordered to withdraw from the crest of a hill so that a mortar barrage could be placed on the ridge. 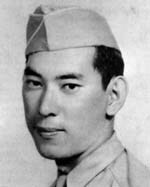 On his own initiative, Private First Class Nakamura remained in position to cover his comrades' withdrawal. While moving toward the safety of a wooded draw, his platoon became pinned down by deadly machine gun fire. Crawling to a point from which he could fire on the enemy position, Private First Class Nakamura quickly and accurately fired his weapon to pin down the enemy machine gunners. His platoon was then able to withdraw to safety without further casualties. Private First Class Nakamura was killed during this heroic stand. Private First Class Nakamura's extraordinary heroism and devotion to duty are in keeping with the highest traditions of military service and reflect great credit on him, his unit, and the United States Army. 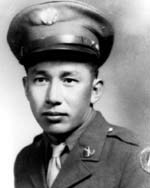 Private First Class Joe M. Nishimoto distinguished himself by extraordinary heroism in action on 7 November 1944, near La Houssiere, France. After three days of unsuccessful attempts by his company to dislodge the enemy from a strongly defended ridge, Private First Class Nishimoto, as acting squad leader, boldly crawled forward through a heavily mined and booby-trapped area. Spotting a machine gun nest, he hurled a grenade and destroyed the emplacement. Then, circling to the rear of another machine gun position, he fired his submachine gun at point-blank range, killing one gunner and wounding another. Pursuing two enemy riflemen, Private First Class Nishimoto killed one, while the other hastily retreated. Continuing his determined assault, he drove another machine gun crew from its position. The enemy, with their key strong points taken, were forced to withdraw from this sector. Private First Class Nishimoto's extraordinary heroism and devotion to duty are in keeping with the highest traditions of military service and reflect great credit on him, his unit, and the United States Army. Sergeant Allan M. Ohata distinguished himself by extraordinary heroism in action on 29 and 30 November 1943, near Cerasuolo, Italy. 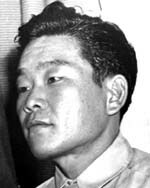 Sergeant Ohata, his squad leader, and three men were ordered to protect his platoon's left flank against an attacking enemy force of 40 men, armed with machine guns, machine pistols, and rifles. He posted one of his men, an automatic rifleman, on the extreme left, 15 yards from his own position. Taking his position, Sergeant Ohata delivered effective fire against the advancing enemy. The man to his left called for assistance when his automatic rifle was shot and damaged. With utter disregard for his personal safety, Sergeant Ohata left his position and advanced 15 yards through heavy machine gun fire. Reaching his comrade's position, he immediately fired upon the enemy, killing 10 enemy soldiers and successfully covering his comrade's withdrawal to replace his damaged weapon. Sergeant Ohata and the automatic rifleman held their position and killed 37 enemy soldiers. Both men then charged the three remaining soldiers and captured them. Later, Sergeant Ohata and the automatic rifleman stopped another attacking force of 14, killing four and wounding three while the others fled. The following day he and the automatic rifleman held their flank with grim determination and staved off all attacks. Staff Sergeant Ohata's extraordinary heroism and devotion to duty are in keeping with the highest traditions of military service and reflect great credit on him, his unit, and the United States Army. Technical Sergeant Yukio Okutsu distinguished himself by extraordinary heroism in action on 7 April 1945, on Mount Belvedere, Italy. While his platoon was halted by the crossfire of three machine guns, Technical Sergeant Okutsu boldly crawled to within 30 yards of the nearest enemy emplacement through heavy fire. He destroyed the position with two accurately placed hand grenades, killing three machine gunners. Crawling and dashing from cover to cover, he threw another grenade, silencing a second machine gun, wounding two enemy soldiers, and forcing two others to surrender. Seeing a third machine gun, which obstructed his platoon's advance, he moved forward through heavy small arms fire and was stunned momentarily by rifle fire, which glanced off his helmet. Recovering, he bravely charged several enemy riflemen with his submachine gun, forcing them to withdraw from their positions. Then, rushing the machine gun nest, he captured the weapon and its entire crew of four. By these single-handed actions he enabled his platoon to resume its assault on a vital objective. The courageous performance of Technical Sergeant Okutsu against formidable odds was an inspiration to all. Technical Sergeant Okutsu's extraordinary heroism and devotion to duty are in keeping with the highest traditions of military service and reflect great credit on him, his unit, and the United States Army. 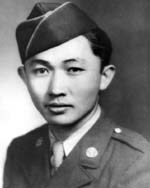 Private First Class Frank H. Ono distinguished himself by extraordinary heroism in action on 4 July 1944, near Castellina, Italy. In attacking a heavily defended hill, Private First Class Ono's squad was caught in a hail of formidable fire from the well-entrenched enemy. 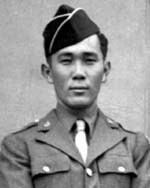 Private First Class Ono opened fire with his automatic rifle and silenced one machine gun 300 hundred yards to the right front. Advancing through incessant fire, he killed a sniper with another burst of fire, and while his squad leader reorganized the rest of the platoon in the rear, he alone defended the critical position. His weapon was then wrenched from his grasp by a burst of enemy machine pistol fire as enemy troops attempted to close in on him. 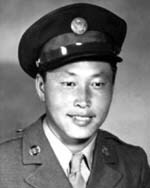 Hurling hand grenades, Private First Class Ono forced the enemy to abandon the attempt, resolutely defending the newly won ground until the rest of the platoon moved forward. Taking a wounded comrade's rifle, Private First Class Ono again joined in the assault. After killing two more enemy soldiers, he boldly ran through withering automatic, small arms, and mortar fire to render first aid to his platoon leader and a seriously wounded rifleman. In danger of being encircled, the platoon was ordered to withdraw. Volunteering to cover the platoon, Private First Class Ono occupied virtually unprotected positions near the crest of the hill, engaging an enemy machine gun emplaced on an adjoining ridge and exchanging fire with snipers armed with machine pistols. Completely disregarding his own safety, he made himself the constant target of concentrated enemy fire until the platoon reached the comparative safety of a draw. He then descended the hill in stages, firing his rifle, until he rejoined the platoon. Private First Class Ono's extraordinary heroism and devotion to duty are in keeping with the highest traditions of military service and reflect great credit on him, his unit, and the United States Army. Private George T. Sakato distinguished himself by extraordinary heroism in action on 29 October 1944, on hill 617 in the vicinity of Biffontaine, France. After his platoon had virtually destroyed two enemy defense lines, during which he personally killed five enemy soldiers and captured four, his unit was pinned down by heavy enemy fire. Disregarding the enemy fire, Private Sakato made a one-man rush that encouraged his platoon to charge and destroy the enemy strongpoint. While his platoon was reorganizing, he proved to be the inspiration of his squad in halting a counter-attack on the left flank during which his squad leader was killed. Taking charge of the squad, he continued his relentless tactics, using an enemy rifle and P-38 pistol to stop an organized enemy attack. During this entire action, he killed 12 and wounded two, personally captured four and assisted his platoon in taking 34 prisoners. By continuously ignoring enemy fire, and by his gallant courage and fighting spirit, he turned impending defeat into victory and helped his platoon complete its mission. 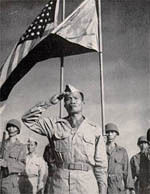 Private Sakato's extraordinary heroism and devotion to duty are in keeping with the highest traditions of military service and reflect great credit on him, his unit, and the United States Army. 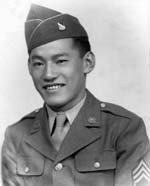 Technical Sergeant Ted T. Tanouye distinguished himself by extraordinary heroism in action on 7 July 1944, near Molino A Ventoabbto, Italy. Technical Sergeant Tanouye led his platoon in an attack to capture the crest of a strategically important hill that afforded little cover. Observing an enemy machine gun crew placing its gun in position to his left front, Technical Sergeant Tanouye crept forward a few yards and opened fire on the position, killing or wounding three and causing two others to disperse. Immediately, an enemy machine pistol opened fire on him. He returned the fire and killed or wounded three more enemy soldiers. 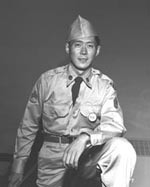 While advancing forward, Technical Sergeant Tanouye was subjected to grenade bursts, which severely wounded his left arm. Sighting an enemy-held trench, he raked the position with fire from his submachine gun and wounded several of the enemy. Running out of ammunition, he crawled 20 yards to obtain several clips from a comrade on his left flank. Next, sighting an enemy machine pistol that had pinned down his men, Technical Sergeant Tanouye crawled forward a few yards and threw a hand grenade into the position, silencing the pistol. He then located another enemy machine gun firing down the slope of the hill, opened fire on it, and silenced that position. Drawing fire from a machine pistol nest located above him, he opened fire on it and wounded three of its occupants. Finally taking his objective, Technical Sergeant Tanouye organized a defensive position on the reverse slope of the hill before accepting first aid treatment and evacuation. Technical Sergeant Tanouye's extraordinary heroism and devotion to duty are in keeping with the highest traditions of military service and reflect great credit on him, his unit, and the United States Army. Rank and organization: Private First Class, U.S. Army, Company C, 23d Infantry Regiment, 2nd Infantry Division. Place and date: Near Pia-ri, Korea, 17 September 1951. Entered service at: Oahu, T.H. 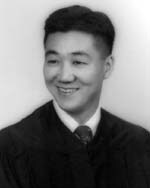 Born: 10 October 1928, Waianae, Oahu, T.H. G.O. No. : 58, 18 June 1952. Citation: Pfc. Pililaau, a member of Company C, distinguished himself by conspicuous gallantry and outstanding courage above and beyond the call of duty in action against the enemy. The enemy sent wave after wave of fanatical troops against his platoon which held a key terrain feature on "Heartbreak Ridge." Valiantly defending its position, the unit repulsed each attack until ammunition became practically exhausted and it was ordered to withdraw to a new position. Voluntarily remaining behind to cover the withdrawal, Pfc. Pililaau fired his automatic weapon into the ranks of the assailants, threw all his grenades and, with ammunition exhausted, closed with the foe in hand-to-hand combat, courageously fighting with his trench knife and bare fists until finally overcome and mortally wounded. When the position was subsequently retaken, more than 40 enemy dead were counted in the area he had so valiantly defended. His heroic devotion to duty, indomitable fighting spirit, and gallant self-sacrifice reflect the highest credit upon himself, the infantry, and the U.S. Army. Rank and organization: Platoon Sergeant (then S/Sgt. ), U.S. Army, 1st Platoon, Company C, 2d Battalion, 8th Infantry, 4th Infantry Division. Place and date: Republic of Vietnam, 16 February 1967. Entered service at: Honolulu, Hawaii. Born: 27 July 1935, Honolulu, Hawaii. Citation: For conspicuous gallantry and intrepidity at the risk of his life above and beyond the call of duty. During a reconnaissance patrol. his platoon was suddenly engaged by intense machinegun fire hemming in the platoon on 3 sides. A defensive perimeter was hastily established, but the enemy added mortar and rocket fire to the deadly fusillade and assaulted the position from several directions. With complete disregard for his safety, P/Sgt. Smith moved through the deadly fire along the defensive line, positioning soldiers, distributing ammunition and encouraging his men to repeal the enemy attack. Struck to the ground by enemy fire which caused a severe shoulder wound, he regained his feet, killed the enemy soldier and continued to move about the perimeter. He was again wounded in the shoulder and stomach but continued moving on his knees to assist in the defense. Noting the enemy massing at a weakened point on the perimeter, he crawled into the open and poured deadly fire into the enemy ranks. As he crawled on, he was struck by a rocket. Moments later, he regained consciousness, and drawing on his fast dwindling strength, continued to crawl from man to man. When he could move no farther, he chose to remain in the open where he could alert the perimeter to the approaching enemy. P/Sgt. Smith perished, never relenting in his determined effort against the enemy. The valorous acts and heroic leadership of this outstanding soldier inspired those remaining members of his platoon to beat back the enemy assaults. P/Sgt. Smith's gallant actions were in keeping with the highest traditions of the U.S. Army and they reflect great credit upon him and the Armed Forces of his country. Rank and organization: Sergeant First Class, U.S. Army, Air Cavalry Troop, 11th Armored Cavalry Regiment. Place and date: Near Bien Hao, Republic of Vietnam, 1 January 1969. Entered service at: Honolulu, Hawaii. 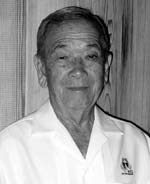 Born: 13 December 1943, Kealakekua Kona, Hawaii. Citation: Sfc. Yano distinguished himself while serving with the Air Cavalry Troop. Sfc. Yano was performing the duties of crew chief aboard the troop's command-and-control helicopter during action against enemy forces entrenched in dense jungle. From an exposed position in the face of intense small arms and antiaircraft fire he delivered suppressive fire upon the enemy forces and marked their positions with smoke and white phosphorous grenades, thus enabling his troop commander to direct accurate and effective artillery fire against the hostile emplacements. A grenade, exploding prematurely, covered him with burning phosphorous, and left him severely wounded. Flaming fragments within the helicopter caused supplies and ammunition to detonate. Dense white smoke filled the aircraft, obscuring the pilot's vision and causing him to lose control. Although having the use of only 1 arm and being partially blinded by the initial explosion, Sfc. Yano completely disregarded his welfare and began hurling blazing ammunition from the helicopter. In so doing he inflicted additional wounds upon himself, yet he persisted until the danger was past. Sfc. Yano's indomitable courage and profound concern for his comrades averted loss of life and additional injury to the rest of the crew. By his conspicuous gallantry at the cost of his life, in the highest traditions of the military service, Sfc. Yano has reflected great credit on himself, his unit, and the U.S. Army.